There is evidence for the activity of living organisms in terrestrial rocks that are 3.5 × 109 years old. These oldest known fossils are the remains of bacteria-like organisms. Over the last 3.5 billion years (which is about a quarter of the age of the Universe), living organisms on Earth have diversified and adapted to almost every environment imaginable (Fig. 4). Fig. 4. 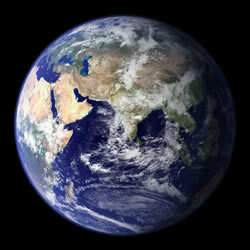 This is a composite image of the Earth created from a range of satellite observations (NASA Goddard Space Flight Center. Image by Reto Stöckli (land surface, shallow water, clouds). Enhancements by Robert Simmon (ocean colour, compositing, 3D globes, animation). Data and technical support: MODIS Land Group; MODIS Science Data Support Team; MODIS Atmosphere Group; MODIS Ocean Group Additional data: USGS EROS Data Center (topography); USGS Terrestrial Remote Sensing Flagstaff Field Center (Antarctica); Defense Meteorological Satellite Program (city lights). CLICK HERE to make the Earth move (thanks to NASA/Goddard Space Flight Center, Scientific Visualization Studio. Movie made from images derived from the flyby of the Galileo spacecraft in December, 1990). For a rather lesser period of time, something like a few hundred years, humanity has worked at systematically finding, naming and classifying all those organisms. In 1866 Ernst Haeckel made one of the first attempts at constructing a phylogenetic classification by dividing organisms into three categories: the Plantae, the Animalia and the Protista (micro-organisms). So for the best part of a century, biologists were content to classify living things as either a plant or animal, because in this classification fungi and lichens were classified with bacteria and algae in a group called the Thallophyta that formed part of the kingdom Plantae. Because of this, mycology developed as a branch of botany. This is somewhat ironic since we now know that the true fungi are more closely related to animals than they are to plants. Towards the middle of the 20th century the nature of bacteria became clearer, but fungi were still classified in the Plant Kingdom (strictly speaking into the subkingdom Cryptogamia, Division Fungi, subdivision Eumycotina) and were separated into four classes: the Phycomycetes, Ascomycetes, Basidiomycetes, and Deuteromycetes (the latter were also known as Fungi Imperfecti and were separated off because they lacked a sexual cycle). These traditional groups of ‘fungi’ were identified by the morphology of their sexual organs, whether their hyphae had septa (cross-walls), and the ploidy (degree of repetition of the basic number of chromosomes) of nuclei in their vegetative mycelium. The slime moulds, all grouped at that time in the subdivision Myxomycotina, were also included in Division Fungi. Some of the terms used in the text either side of this Resources Box are explained here, and with particular reference to fungi. CLICK HERE to visit the page providing these definitions. By the 1950s and 1960s it had become very clear that this system failed to deal properly with the fungi, protists, and bacteria and in 1969 Robert Harding Whittaker published a classification scheme in which he divided organisms into five Kingdoms: Animalia, Plantae, Fungi, Protista (eukaryotic microorganisms, and a mixed grouping of protozoa and algae) and Monera (prokaryotic microorganisms, bacteria and archaea). So, by the 1970s, a system of five Kingdoms had come to be accepted as the best way to classify living organisms. Fundamentally, a distinction is made between prokaryotes and the four eukaryotic kingdoms (plants, animals, fungi, and protists). The prokaryote/eukaryote distinction recognises the ‘higher organism’ traits that eukaryotic organisms share, such as nuclei, cytoskeletons, internal membranes, and mitotic and meiotic division cycles. The most convincing endosymbiosis theory of Lynn Margulis (Margulis, 2004) accounts for the origin of the set of features that characterise the modern eukaryote through a sequence of symbiotic relationships being established between ‘prokaryotic’ partners. The mitochondria of eukaryotes evolving from aerobic ‘bacteria’ living within a host cell; chloroplasts of eukaryotes evolving from endosymbiotic ‘cyanobacteria’; eukaryotic cilia and flagella arising from endosymbiotic ‘spirochetes’, the basal bodies from which eukaryotic cilia and flagella develop being able to create the mitotic spindle and thus contribute to the cytoskeleton. The early eukaryotes were anaerobic, sometimes aerotolerant, organisms that lacked mitochondria and peroxisomes. It is presumed that these groups diversified prior to the endosymbiotic events which gave rise to mitochondria. Today, most of these ‘primitive’ eukaryotes are parasites of other eukaryotes, from microorganisms to humans, but free-living relatives of these parasites branch deep in the evolutionary tree. These kinds of classification schemes of organisms were historically based on taxonomy according to similarity, but this approach has been replaced by one firmly based on phylogenetics. The term comes from the Greek words phyle, meaning tribe or race, and genetikos, meaning from birth, so it is applied to the study of evolutionary relatedness within and between populations. Phylogenetic taxonomy is a ‘natural’ taxonomy because the classification is based on grouping by ancestral traits. However, before the development of molecular techniques, it really was not possible to determine evolutionary relationships of present-day organisms on a sufficiently comprehensive scale to construct a meaningful Tree of Life. The breakthrough was made by Carl Woese who concluded that, because all organisms possessed small subunit rRNA (SSU rRNA, so called because they form part of the small subunit of a ribosome), the small subunit rRNA gene would be a perfect candidate as the universal chronometer of all life. SSU rRNA genes (16S rRNA in prokaryotes and mitochondria, 18S rRNA in eukaryotes) display a mosaic of conservation patterns, with rapidly evolving regions interspersed among moderately or nearly invariant regions (it has been estimated that about 56% of the nucleotide positions in 18S rRNA data sets are not free to vary and have not undergone substitutions useful in phylogenetic reconstructions). This variation in conservation permits SSU rRNA gene sequences to be used as sophisticated chronometers of evolution with the slowly evolving regions recording events that occurred many millions of years ago, and the rapidly evolving regions chronicling more recent events. In Woese’s procedure, pairs of SSU rRNA gene sequences from different organisms were aligned, and the differences counted and considered to be some measure of ‘evolutionary distance’ between the organisms. Pair-wise differences between many organisms were then used to infer phylogenetic trees, maps that represent the evolutionary paths leading to the SSU rRNA gene sequences of present-day organisms. Of course, such trees rely on many assumptions, among which are assumptions about the rate of mutational change (the ‘evolutionary clock’) and that rRNA genes are free from artefacts generated by convergent evolution or lateral gene transfer (Woese, 1987; Woese et al., 1990). Woese’s studies called into question many beliefs about evolutionary relationships between organisms and brought order to biological diversity. Most importantly, the tree of life constructed from SSU rRNA gene sequences led Woese to recognise three primary lines of evolutionary descent (first called Kingdoms, but subsequently renamed Domains; a new taxon above the level of Kingdom): the Bacteria (now called Eubacteria), the Archaea and the Eucarya (now called Eukaryota). These three Domains were thought to have diverged from some ‘universal ancestor’ (which was the first chemical aggregate that was the first to be truly alive). The first two Domains contain prokaryotic microorganisms and the third domain contains all eukaryotic organisms. There has been a good deal of speculation about the universal ancestor, which, rather than being a primitive ‘prokaryote’, might well have had a complex cell like a eukaryote, with archaea and eubacteria evolving from it by reduction and simplification (Doolittle, 2000). Penny & Poole (1999) pointed out that modern eukaryotes use RNAs to catalyse intron splicing and stable RNA processing and suggested that these processes could be ‘molecular fossils’ from the RNA-world that may have been the first step in the origin of life, before the evolution of protein catalysis. So, the universal ancestor might have possessed some extremely primitive features that are now considered to be characteristic of present day eukaryotes. If these relics of the RNA world were present in the universal ancestor, it doesn’t mean that the ancestor was eukaryotic. Rather, the ancestor contained a mix of features that were selected and combined in different ways during evolution of the present-day archaea, eubacteria and eukaryotes. change in sequence at a rate proportionate with the evolutionary distance to be measured (the broader the phylogenetic distance being measured, the slower must be the rate at which the sequence changes). Although SSU rRNA genes satisfy these criteria, it is important not to allow phylogenetic trees based on a single gene to dominate evolutionary and systematic conclusions. Instead, account needs to be taken of phylogenetic trees based on a range of conserved molecules with a judgement being made about the weight to be given to the different lines of evidence so obtained. Among the sequences that have been used successfully in multi-gene phylogenies are ATPase genes; the ATPase enzymes are composed of several different kinds of subunits, each related among themselves. The F-, V- and A-enzymes have catalytic and non-catalytic subunits, which are thought to have arisen during early gene duplications prior to the separation of the three domains. Because of this, the phylogenetic tree inferred from catalytic subunits can be rooted with the non-catalytic subunits. Using ATPase subunits, the root of the tree of life was placed on the Eubacterial branch, making the Eukaryota and Archaea sister taxa. This conclusion was supported by studies using aminoacyl tRNA synthetase gene sequences. These genes form a series of 20 enzyme families, with each family the result of gene duplication again argued to predate the origin of the three domains. Thus, aminoacyl tRNA synthase phylogenetic trees can be rooted in a fashion like that for the ATPase trees. The ribosomal gene cluster is another regular contributor to construction of phylogenetic trees. Ribosomal genes are usually present in genomes in large numbers (100 to 200 tandem repeats) but they evolve as a single unit. The large quantities of rRNAs expressed by cells make their isolation and purification relatively easy despite the nearly ubiquitous occurrence of stable RNAses. Additionally, rDNA can be sequenced using specific oligonucleotide primers and the polymerase chain reaction (PCR). Because each genome contains many identical copies of the ribosomal genes, at least one copy for molecular analysis can usually be recovered, even from low-quality DNA preparations. Importantly, rDNA sequencing results in fewer artefacts than rRNA sequencing, and offers the opportunity of sequencing both strands of the rRNA sequences, providing a further check against sequencing errors. Three regions of the ribosomal gene cluster in eukaryotes code for rRNA genes, which are transcribed into 5.8S, 18S and 28S RNA molecules that form part of the ribosome structure. Of the approximately 9,000 nucleotides in a ribosomal repeat, the 18S gene accounts for about 1,800 bp, the 5.8S gene for about 120 bp and the 28S gene for about 3,200 bp. Interspersed between the rRNA genes are spacer regions. The areas that lie between the 18S and 5.8S and between the 5.8S and 28S genes are called internally transcribed spacers (ITS1 and ITS2). The ITS1 and ITS2 regions are transcribed together as a single unit, then cleaved into separate RNA products, and finally eliminated in the process that yields rRNA. The region that separates one ribosomal gene cluster from the next is called the intergenic spacer region (IGS), which is made up of the non-transcribed spacer region (NTS) and the externally transcribed spacer region (ETS). The rRNA product from the ETS region suffers a similar fate to the internally transcribed spacers. The rRNA genes, the transcribed spacers (ITS and ETS) and the non-transcribed spacer (NTS) evolve at different rates and because of this their sequences have become widely used to discriminate between fungal taxa at levels from the kingdom to the intraspecific strains and races (Table 1). Sequences other than the ribosomal gene cluster and ATPases that have been used in phylogenetic studies of eukaryotes include: ribosomal protein factors, tubulin (alpha (a) and beta (b)), actins, and cytochromes. Protein sequences, which are made up of 20 amino acids, offer several advantages over DNA sequences (made up of four nucleotides) for some phylogenetic studies because homology (similarity due to shared ancestry) is more easily distinguished from analogy (similarity in structure or function that evolved through different pathways and different ancestries, a process known as convergent evolution). Further, length changes are infrequent in protein-coding genes because insertions and deletions often lead to such large shifts in the reading frame that they are fatal, and so fail to persist in the lineage. Mitochondria and their protein coding genes are present in multiple copies in most cells and mitochondrial genes are easy to amplify, even from starting DNA of low quality. However, relatively few phylogenetic studies of fungi have used mitochondrial protein coding genes. It has been estimated that the Domain Eubacteria and the common ancestor to the Domains Archaea and Eukaryota diverged about four billion years ago, with the Eukaryota arising on the Archaea lineage about two billion years ago (Fig. 5). The root of the universal tree of life remains controversial, though. Evidence for ancient lateral transfers of genes and uncertainty over the ancestry of Archaea makes the distant origins of the major lineages of Life uncertain. Inferring ancient relationships is full of difficulties. If the data contains too little information, random errors can swamp the truth, and random errors can be introduced by the mathematical model used to interpret the data. The method used to establish the phylogenetic trees can also introduce more systematic errors if it is too simplistic (explanations and further references in Keeling et al. 2005). Fig. 5. One view of the most ancient relationships of the major lineages of the Domains of Life, redrawn from the Tree of Life Web Project (http://tolweb.org/Life_on_Earth/1/1997.01.01). Eocytes are a group of sulfur-dependent bacteria with an unique pattern of organisation of ribosomal large and small subunits. They are closely related to eukaryotes. Most of the best-investigated species of Archaea are members of two main phyla: the Euryarchaeota, composed of methanogens and extreme halophiles, and Crenarchaeota, composed of the extreme thermophiles. and view the Taxonomic Outline of Bacteria and Archaea at this URL http://www.taxonomicoutline.org/. Errors amplify as you attempt to reach back further in time, in what is called deep time (hundreds of millions to billions of years) where you are looking for deep divergences between major groups of organisms. Fossils are necessary to calibrate phylogenetic trees to a real time-line, but there is a very patchy fossil record and the older the fossil the greater the debate about its nature. The result of such errors and uncertainties is that the timings inferred for major events (like the divergences of major eukaryote groups) in different studies can differ by several hundred million years, or more. For example, one study claims the common ancestor of living eukaryotes existed 2.3 billion years ago. Another puts the time of eukaryote divergence at 0.95 to 1.26 billion years ago. The two studies used different methods and different phylogenetic models; their different dates could mean that the common ancestor existed for a billion years before evolving into the plant, animal and fungal lines or it could mean that the best we can say is that the divergence event occurred some time between 0.95 and 2.3 billion years ago. Archaea and Eukaryota are sister groups with a common ancestor (Fig. 5), so their modern representatives share many properties that differ from those found in the Eubacteria. For example, the RNA polymerase of Archaea and Eukaryota resemble each other in subunit composition and sequence far more closely than either resembles the type of polymerase found in Eubacteria. Also, the Archaea and Eukaryota use TATA-binding proteins to regulate the initiation of transcription, whilst the Eubacteria use sigma transcription factors. Overall, the Archaea and Eukaryota are more closely related to each other than either is to the Eubacteria and it follows from this that, despite their prokaryotic nature, members of the Archaea should not be regarded as bacteria, a conclusion that some bacteriologists still find difficult to accept (similarly, some mycologists find it difficult to accept that the Oomycetes are not true fungi). A more complete fossil record, improved molecular dating method, and a better understanding of molecular evolution will be needed before the true ages of the eukaryote lines of evolution can be determined with any certainty. As we have explained above, phylogenetic trees are currently built using a wide variety of data, which are largely, but not entirely, molecular in nature. It is now accepted that molecular sequences are generally more revealing of evolutionary relationships than are classical phenotypes and this is particularly true for micro-organisms. Some of the terminology that has grown up in this area of research is explained in our Resources Box. The opinions presented above are largely based on studies that built on the established schemes of evolutionary relationships developed using morphology and biochemistry that were available when the first edition of this book was written (for example: Doolittle et al., 1996; Embley & Hirt, 1998; Aravind & Subramanian, 1999; Philippe et al., 2000; Keeling et al. 2005). More recent work has featured enormously improved methods of analysis (and by that we mean both improved sequence analysis of biopolymers and improved computational software and firmware) that allow phylogenetic comparisons to be made between multiple single copy genes, whole genomes, all the RNA sequences produced by the studied organisms (their transcriptomes), all their polypeptide sequences (their proteomes), or profiles of all the small-molecule metabolite profiles in cells, tissues, or organisms (their metabolomes). Or any combination of these. We will consider these recent analyses as they apply to fungi as appropriate later in this text. But for the moment we must be satisfied with generalisations about the phylogeny of the Domains of organisms; and the generalisations we favour are that eukaryotes and prokaryotes diverged 2 billion years ago, and plants, animals and fungi diverged from one another 1 billion years ago. Today microbes often live in mixed communities that are capable of rapid attachment to surfaces as a biofilm. Biofilms are an important component of our present environment, being found essentially everywhere on Earth, including in extreme environments (https://en.wikipedia.org/wiki/Biofilm; Flemming & Wingender, 2010). Most are beneficial or harmless but those that form on clinical equipment and many household surfaces can cause harm. Biofilm formation is so obviously beneficial to the organisms in the community that it must have arisen at an early stage in evolution. So perhaps we should think in terms of the microorganisms that existed for the first three billion years of life on Earth forming extensive biofilms over moist surfaces (and that would include the surfaces of bodies of shallow water). Some of those biofilms would have contained photosynthetic microbes, cyanobacterial as well as, eventually, algal. Analyses of carbon isotope ratios in ancient carbonate rocks suggest that the ‘greening of Earth’ started about 850 million years ago in coastal regions and resulted in an extensive spread of photosynthetic microbes as ‘…an explosion of photosynthesising communities on late Precambrian land surfaces …’ (Knauth & Kennedy, 2009; Hand, 2009; for counter arguments see Arthur, 2009). Geological evidence indicates that oxygenic photosynthesis (which uses water as an electron donor and produces molecular oxygen) by cyanobacteria became important around 2 billion years ago (Cardona et al., 2015; https://en.wikipedia.org/wiki/Evolution_of_photosynthesis). By 1,000 million years ago this ‘greening’ was sufficient to increase atmospheric oxygen, alter the chemical breakdown of rocks on the Earth’s surface and increase nutrient flux and organic matter in ancient soils and sediments (Sage et al., 2012; Williams et al., 2013). Primitive biofilms would have also contained fungi (and even more primitive filamentous organisms that had not yet evolved into fungi); because an important ability of hyphal growth is that filamentous hyphae can escape from the biofilm. Even more importantly, filamentous hyphae, by secreting their digestive enzymes into their environment, can exploit the biofilm, digesting the adhesives, gums and other polymers that make up the biofilm matrix and parasitising the photosynthetic microbes to recruit photobionts into primitive lichen-like arrangements.